Observing with maximal aperture with your feet still on solid ground, and no need for tall ladders or stairs. 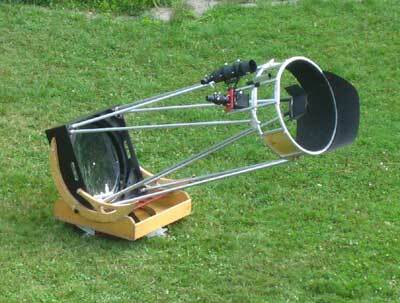 This can be achieved by folding the light path stronger than in a classical Newton telescope. This is the idea behind the "Lowrider". 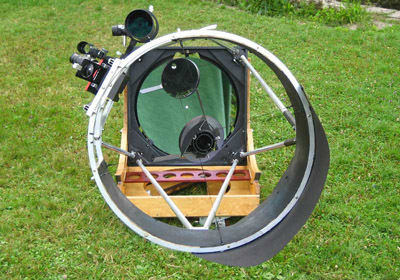 When I started to design the telescope, I already had some ideas about its main features: First, I wanted to make all the optics, primary and secondary mirror, by myself. 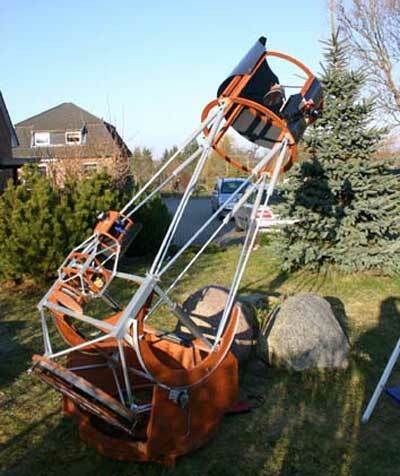 Further, I wanted a telescope which should allow observing even in the zenith without a ladder or a small stair, which should be as easy to use as my 14 inch Dobsonian, and which should on the other hand have a considerably larger aperture. 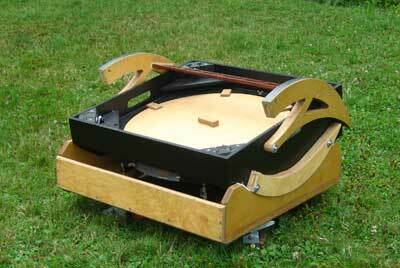 Even with the Lowrider design, this can be accomplished only with a primary with a fast focal ratio. After having gone through all the different alternatives, I ended up with a 22 inch f/4 primary mirror. 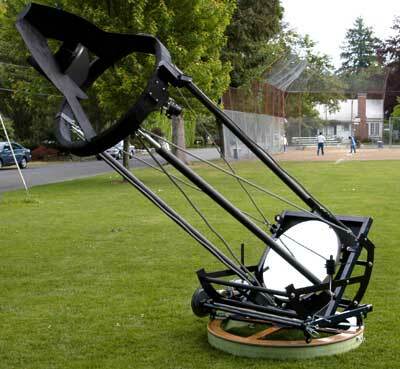 This would yield an eyepiece height sufficiently low to allow even the use of an equatorial platform (a must!). 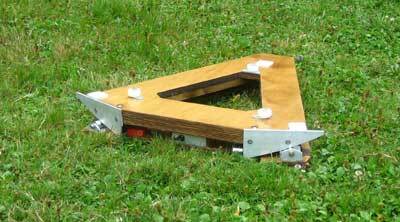 The Lowrider design: By tilting the secondary stronger than in the classical Newtonian, the light path is deflected downward and also the position of the secondary moves slightly downward. In turn, the size of the secondary must be slightly increased, leading to a still very acceptable central obstruction of 25%. Tilt angles alpha of 30° can be used without running into baffling problems (larger tilt angles, however, may impose serious problems). 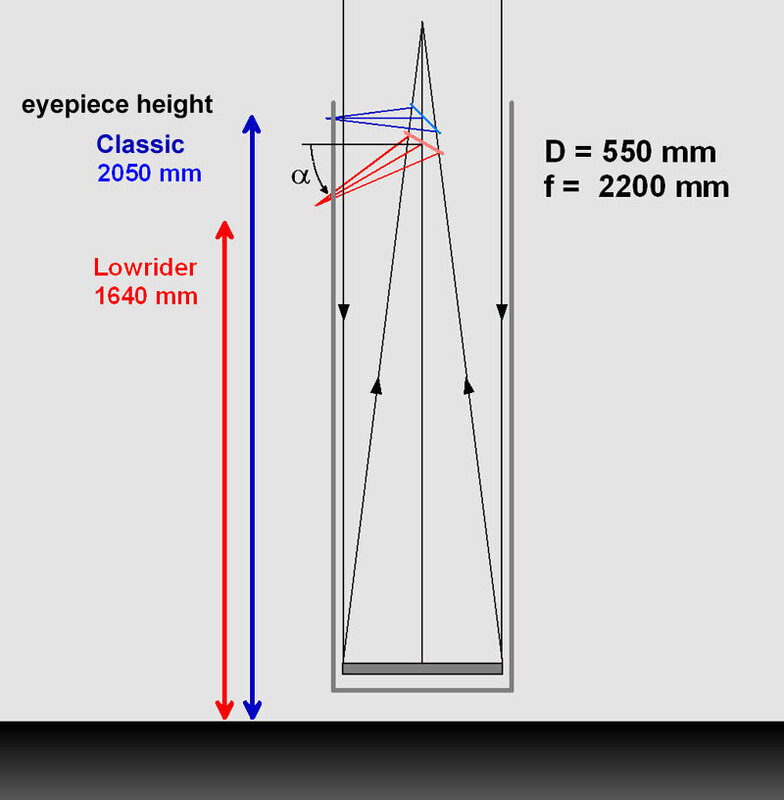 In the example to the right, the Lowrider design lowers the height of the eyepiece by roughly 40 cm. In combination with a fast f/4 focal ratio, the eyepiece position is low enough even for a 22" aperture to allow for observing with your feet on the ground. 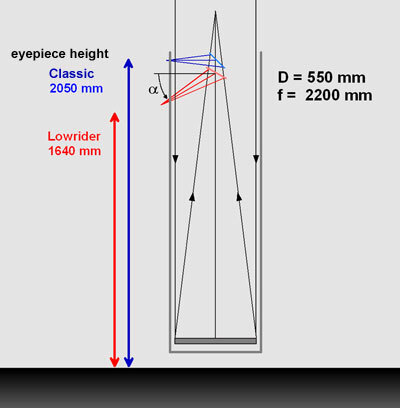 Planning a Lowrider: Calculation of the eyepiece position is best done by a drawing. 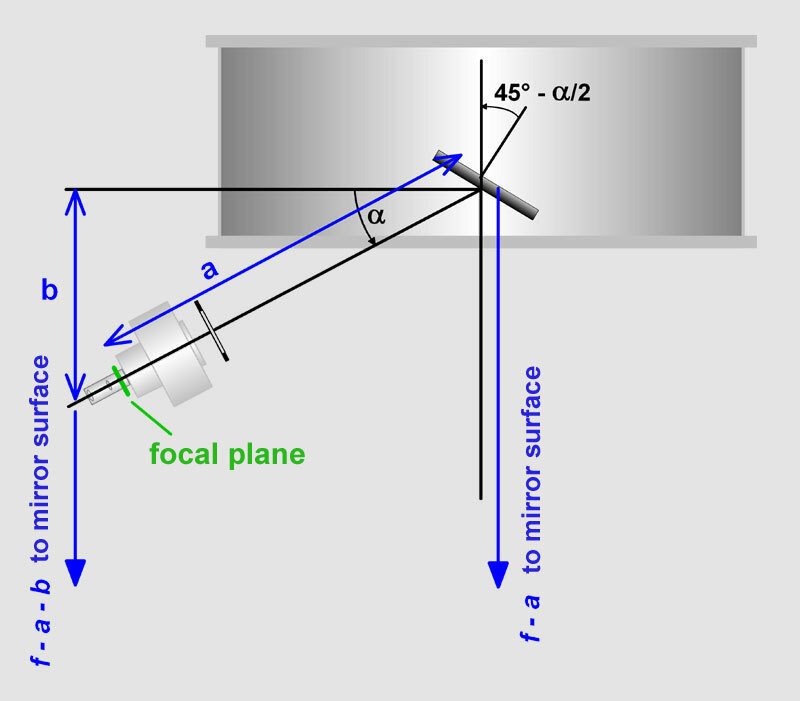 The distance a between the focal plane (in green) and the secondary mirror should be large enough to accommodate focuser, focuser travel, a focuser baffle, and other parts as for instance a filter slide. b can be obtained from the drawing, taking into account also the approximate size of the eyepiece. 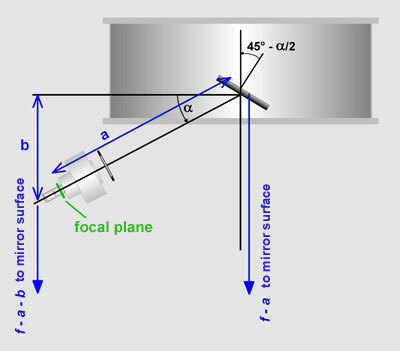 The distance between the eyepiece and the mirror is f - a - b, where f is the focal length of the primary. 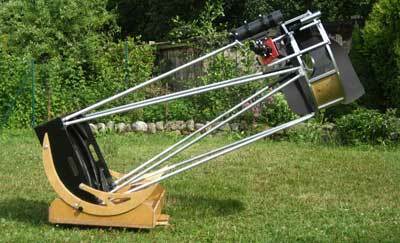 The eyepiece position above ground is obtained by adding the distance from the primary to the ground. In an optimized large Dobsonian, 20 cm are a good estimate for the latter distance. The design of a Lowrider can be done with the same computer software written for classical Newtonians (for instance Newt). The larger value of the distance a as compared with a classical Newtonian can be taken into account by increasing, for instance, the value of the tube thickness accordingly in the software. Front baffle diameter, small axis of the secondary, and illuminated field can then be calculated correctly by the software. Making the Lowrider: Regarding the primary mirror, I had some rough idea of what I would get into: Much bigger and a much more difficult focal ratio. Yet in some way feasible. But I had no idea about the difficulties involved in making the secondary mirror, as I had never made something like that. Therefore I started with the secondary to find out about this. I still had Carbo, Ceroxide and pitch left from my previous mirror, such that I had to buy only the three inexpensive 6 inch borofloat glass disks used for grinding. 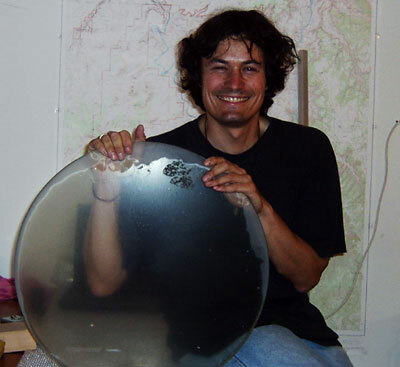 The main concern when making a secondary mirror are the error margins, in particular for the radius of curvature of the surface, which should be "as infinite as possible". Unlike for making the primary mirror, there are two extremely sensitive and easy-to-use null-tests for testing the surface: the Foucault test against a reference sphere and the Ritchey-Common test. 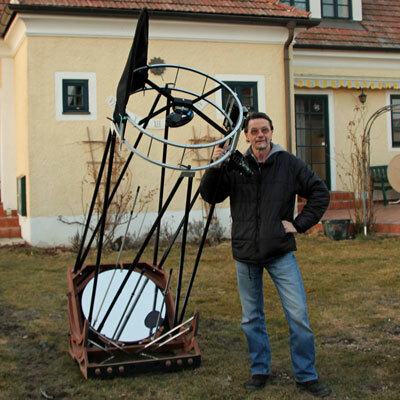 After having finished the secondary mirror, I continued building the telescope. I started with the mirror box and cell and made then the secondary cage with all its components from rings of square aluminum tubing. Then I could calculate the expected center of mass of the telescope and continue with the truss tubes, the altitude bearings, and the rocker box. The primary mirror is made of a pre-curved Pyrex plate of 40 mm thickness and 550 mm diameter, which I bought from Reginato in Italy (highly recommended ). I used a 45 cm sub-diameter tile tool for grinding and a series of tools ranging from 40 to 4 cm diameter for polishing and figuring. Polishing with a 40 cm tool was extremely exhausting, but the polishing progress was really fast. 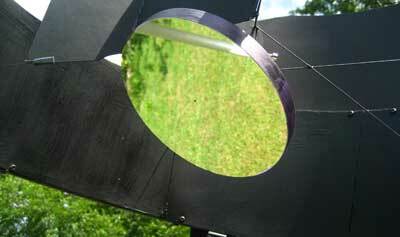 Unlike small mirrors, figuring big aperture mirrors means to remove still lots of glass. It took me several evenings to deepen the middle of the mirror. As I worked with sub-diameter tools, I always had to test for astigmatism and remove it, if necessary. This testing is still no big deal in the beginning, while the mirror is largely spherical, but it becomes more and more difficult as you approach the parabolic figure. 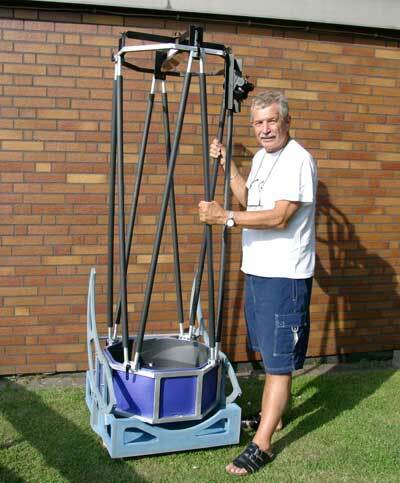 As for my smaller Dob, I made an equatorial platform for the lowrider Dob. 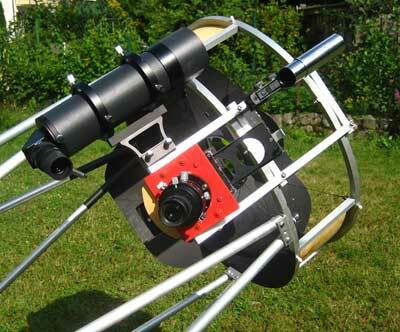 The platform is very sturdy and has a quite low profile, increasing the eyepiece height by only 60 mm. Setting up the telescope takes about five minutes. First the platform is put on the ground and oriented towards North. 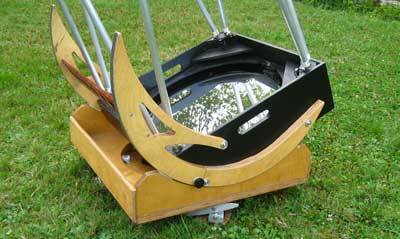 The rockerbox and the mirrorbox are put onto the equatorial platform. For easy transport, the altitude bearings can be folded, which saves space in the car and renders mounting and dismounting of the bearings dispensable. The truss tubes come in pairs and are inserted into the clamps of the mirror box. Then the secondary cage is placed on top of the truss and fixed with four quick releases. Finally, the baffles and the two finders are attached to the secondary cage. Not shown here is a 30cm shroud baffle above the mirror box. Observing with the Lowrider is simply fun . I had sometimes used the 20" f/5 Dobsonian of our local astronomy club, but I found climbing the ladder always annoying and distracting. The 22" Lowrider is very different in that regard and its handling is much more similar to that of my old 14" Dob. Only when you look through the eyepiece, you will notice that it is NOT a 14 inch . 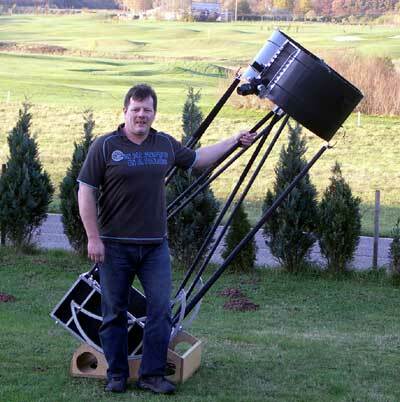 The whole telescope weights approximately 45 kg. The secondary cage is about 4 kg, the poles 3.5 kg, the mirror box and the altitude bearings 10.5 kg, the mirror 19 kg, and the rocker box about 8 kg.